3 night minimum stay. Holiday and peak season minimum stays may be greater. Enjoy vacationing at this lovely 4 bedroom home. BRAND NEW CARPET 2018 season! Two levels with 3 bedrooms and two baths on the first level. Screened porch off downstairs queen bedroom. Upper level has an updated kitchen with granite countertops and eat in area with table that seats 4. Pass thru to dining side with large table seating 6. Living area is bright and colorful, with vaulted ceiling and access to a deck. Flat screen TV now equipped with soundbar and subwoofer to stream music from your Ipod! There is a gas grill and limited ocean views here. Master bedroom has a king bed and private bath. There are 3 TVs in the home. Guests have WIFI internet. This is our only dog friendly home in North Beach. Beach access to Boardwalk #1 is just a short, one minute walk away, then five minutes from there to the beach. Being a former property owner at Seabrook, I always enjoy renting from other owners. The property was as described and the service we received from our realtor was excellent. While the unit itself was a little dated it was well maintained. The only thing I would recommend is a better maintained outdoor grill and some type of umbrella for the table on the main deck. We also appreciate the fact it was dog friendly since on this rare occasion we had to take our pet with us (we normally do not take our dog). The only minor issue we had was that at the main pool. Even though they were on (off season hours) nothing was open. The hut where there were supposed to be towels was closed and the restaurant pool side was not open even though it said if would be (along with the island shop) Also, it did not appear the pool was cleaned daily as there was dirt and a ton of bugs in the water...we heard several people complain about that also. That was a disappointing ... the restaurants at Freshfields were all very good and the Sushi restaurant had the best sushi I’ve ever had anywhere in the states. We would definitely recommend the property and Seabrook for sure. The house is in such a great location. Very easy bike ride (or even walk) to the beach. The house is in good shape but could use some minor updates (porch furniture, etc...). Relaxing Spring Break Family Home! I grew up going to Seabrook, so I was so excited to share this beautiful island with my friends and family. This house was perfect for several couples and small babies; the split-level meant everyone had privacy (the double-porches are perfect! ), but the great room upstairs was big enough for everyone to comfortably hang out together. The kitchen isn't updated, but it worked for our group. Proximity to the beach and sounds of the ocean off of the porch is just perfect. House was perfect for us and daughter and her family. My daughter and her husband had the downstairs along with the grandkids - my husband and I had the bedroom upstairs. Thank you for providing such a lovely and convenient pet friendly home. The Good: Very clean (although the outside uncovered deck was a bit of a mess -- not covered in the cleaning contract, I suppose). Master bed on second floor is VERY comfortable. Some nice decorations. WIFI reception was great. TV reception was great in the living room -- we didn't try it elsewhere. The Mediocre: Very outdated bathrooms, but everything worked (we didn't try the whirlpool tub). The Bad: Sliding glass door to the screened porch is REALLY bad--sticks horribly--we made the mistake of closing it when we went out there and were stuck out there for a good long while before we wrenched it open (no stairs down to the ground - BEWARE). The windows are very cranky -- tried to open a few to get a breeze, we unlatched the side bar on one, but something was preventing the turn handle that opens the window from doing much. We tried another one and it was just very difficult. At that point, we gave up. Many little nicks in furniture. Big stain on drapes in twin bedroom, stains on couch. VERY uncomfortable side chairs in living room. Discolored back riser on stove from burn. Some unprofessional painter made a visual mess of the fan in the master bedroom--but it did work. The switch on the lamp in the dining room by the pass-through window was inoperable. The drapes in the living room did not close all the way leaving a gap of several inches (there is another house directly in back of those drapes). Cracked shelving in refrigerator. Had a great time on Seabrook Island for our daughter's wedding! The house was perfect for what we needed and it was pet friendly, and just a short walk to north beach! It was clean and comfortable and worked well for hosting overnight guests as well as the Sunday brunch the day after the wedding. The online property description states "... 3 bedrooms and two baths on the first level. Screened porch off downstairs queen bedroom." There is in fact no access to the screened porch via the Queen bedroom. The access is via what appears to be a Den converted to a 4th bedroom by adding twin beds (no closet, no solid interior door). This was an issue only because the two grand kids had agreed beforehand that the 12-yr. old boy would have the TV and the 9-yr. old girl would have the porch, NOT that the boy would have the TV AND the porch. Of course, had it not been that issue, they would probably have been squabbling over something else all week! So overall, it was a good trip. Just be advised that the bedrooms are not as advertised. Our family vacation on Seabrook Island was so special. We could not believe how manicured and beautiful the entire island was. We truly enjoyed the house, its decks and the easy walk to the pristine beach. We bicycled all over the island and met so many wonderful people. It was really hard to pack up our things and leave! We all hope to be back again next year. Thanks for your return stay with us! We have added items in the kitchen per your suggestions. We always look forward to seeing you and your family back at Seabrook Island. The staff at Seabrook Exclusives is the BEST! It was obvious from the kitchen that no one actually lives here. Although we give high ratings to this villa, the kitchen is woefully under stocked. There are no non-stick skillets or pans. We are eat-at-home people because of our son's low sodium diet and had a rough time preparing meals with what was available. I ended up driving to Walmart to buy some cheap skillets and get some salt and pepper. The beds are all very comfortable and the furniture adequate. The proximity to the beach is great! 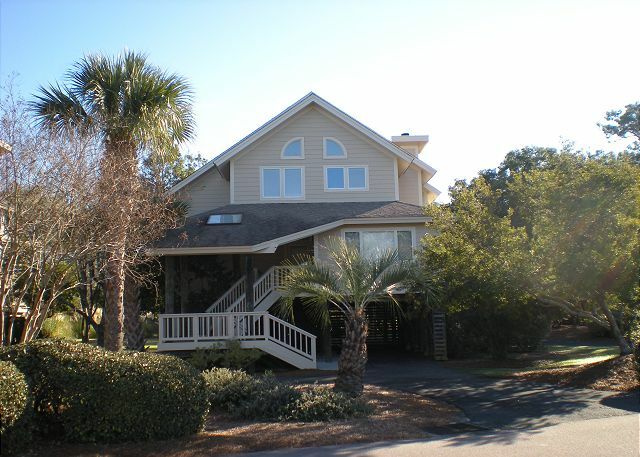 Seabrooke is a great relaxing family vacation. We are limited to homes as we prefer to bring Fido. Aside from a quickly resolved issue with folks painting the house on our first day, the house was only ok. The kitchen was very basic, plastic dishes, no extras like spices, tin foil, that kind of stuff that makes one fel welcome. A few screens were missing and it was difficult to open many windows. Saying all that, we would stay there again, it just could be better apportioned. We had a great time. Even cold weather did not dampen our week. Suggest owner provide a couple of cutting boards and non stick pans in the Kitchen. Amd a blanket or two would also be helpful. Great resort amenities and conveience shopping. Restaurants very good too. Betsy and Kat do a superlative job! This was a perfect home to share with adult children and grandchildren. Lots of space for everyone to spread out and close to the beach. Our family spent a second of three one week Sefabrook vacations here. The property is beginning to show some wear and is in need of updating, but still was provided a memorable experience for both young and old. Kitchen is minimally but adequately equipped. Location is premium. Very clean pet friendly home in great location. Home layout worked well for our family. Seabrook Exclusive staff are so nice and responsive to work with. Thank you for providing pet friendly options; our chihuahua had a great time, too. We enjoyed our week in this house. The split plan worked out perfect for us. The location is close to the beach and a great place to ride bikes. Considering staying here again next year. The upstairs deck was perfect for late afternoon relaxation with the family! Seabrook Exclusives did a great job! We enjoyed our stay. Unfortunatly, someone in our party suffered a heart attck to cut the fun a bit short. The Seabrook emt were very good at responding quickly. The house has an ant issue that may need addressed, other than that, we loved it. Hope to return. This house is a very short walking distance from the beach and pool. The area is a about 40 mins from downtown Charleston but the drive is well worth it. The house is so open and light. It's in a very peaceful and friendly area. The house was lovely, great location, amazing beach, all in all just about perfect. A very minor point for everyone else, but an important consideration for our family was the glasstopped kitchen table with sharp edges, right at eye level for our 18 month old grandson. Everyone at Seabrook Exclusives could not have been more helpful or friendly! Thanks so much! Refrigerator door needs to be reversed. One of the outlets in the kitchen is not functional. Seabrook Exclusives, the leasing agent, does a terrific job! We love the North Beach area and the fact that this property was pet friendly it met our needs. Pleasantly surprised that it was very clean and property was very comfortable. We followed renters who apparently had been extremely hard on the house (downed ceiling in the carport area, toilet problems, etc.) and the cleaning people and maintenance did a good job making the house presentable for us. Location and the ability to bring your pet are the best! Very nice home and a short walk to the beach. Friendly neigborhood. Only issue was that it was a 20 minute drive each way to any stores for groceeries, etc. Betsy was wonderful to work with and the home was just perfect for our family. We will absolutely be back!! Great location, nice house and wonderful time. Would return to the same location again!! Management Company was great to work with. Very quiet in October; walk to the beach quite manageable, but house has lots of stairs! Betsy and Kat were very helpful, as always, in assuring that our vacation went well for us and our guests. We loved this house and it's location! The only complaint we have is that it would have been appreciated if we had been informed that the 'community' pool across the street from the home is inaccessible to renters as that was a major reason we chose this particular location. However, the short walk to the beautiful North Beach made up for it. The only other recommendation would be to either repair or remove some of the peeling wallpaper in the home. We will definitely be returning to Seabrook Island in the future! Thanks for your comments! The North Beach pool has always been a property owners only pool. We do not ever market it to guests since it has never been available for non owners. The house was dog friendly and close to the dog of leash section of the beach--just a short walk! This place was terrific for our active family. This is a great place to relax and enjoy the beach,ocean, day trips with family. The people that handled our rental made this a memorable vacation. Thanks Seabrook. Very pleasant experience - the staff was very helpful and responsive when I had questions. The follow-up was excellent. Comfortable home with many amenities. Convenient access to the beach. We would rent this home again. Overall great rental - North Beach location is ideal. Short walk to beach, and only a few minutes bike ride to the pool / beach club. Kitchen was a bit small with minimal equipment for those who like to cook a lot. Our weekend at Seabrook at this house was a wonderful time. We were able to take our dog and enjoy the beach with him and the house was totally large enough for both of our families that went. The location to North Beach was a very manageable walk and there were carts that we used to take our stuff to the beach. The house had most everything we needed and what it did not have I requested and the management company was outstanding. Betsy from Seabrook Exclusives was a big asset to me and helped me with everything without ever any problem and a great attitude. Thanks for a memorable stay.